The fighting intensifies at Kelly Field. 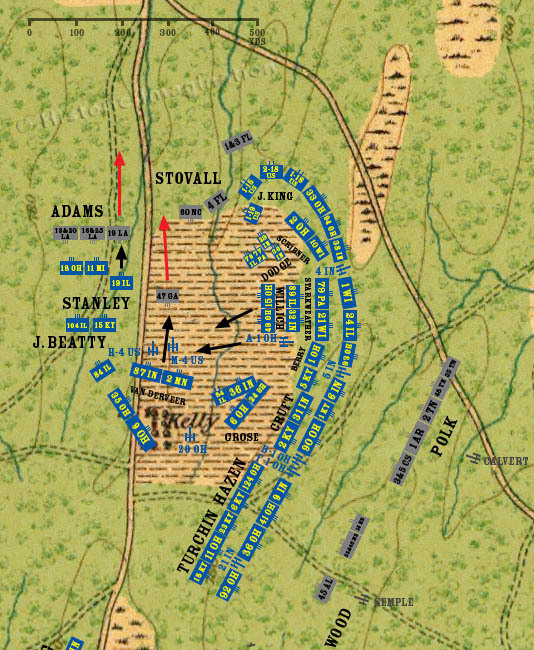 Stanley advances the 19th Illinois from its supporting position, and the 19th Louisiana breaks and falls back. To the east, Van Derveer’s two front-line regiments march through the two Union batteries and force the 47th Georgia back to the woodline. General Augustus Willich orders his two rear regiments to about face and march to the support of Batteries H and M. Battery A, 1st Ohio goes with them. The Regular Brigade continues to fight Stovall’s Confederates. The brigades of Grose and Dodge attempt to rally and reform their commands and rejoin the fight.